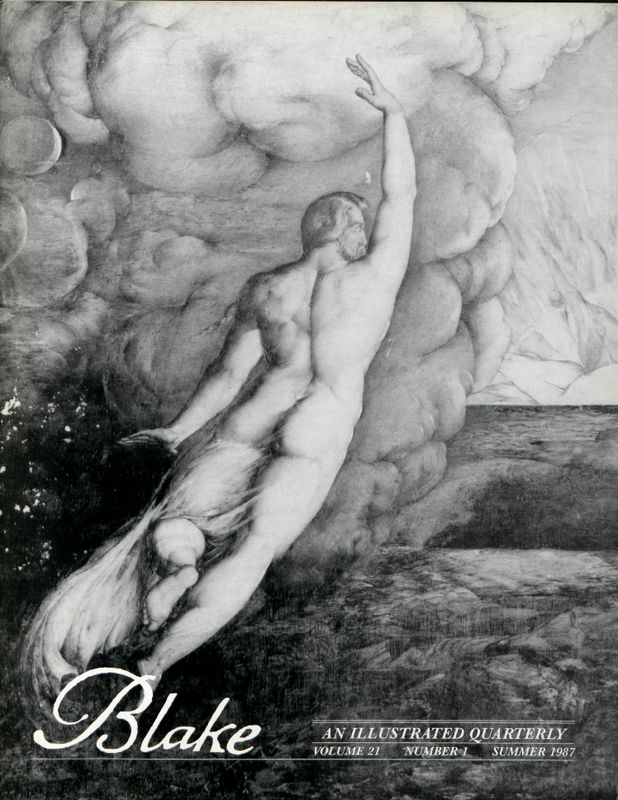 A Catalogue of the Lawrence Lande William Blake Collection in the Department of Rare Books and Special Collections of the McGill University Libraries, reviewed by G. E. Bentley, Jr.
Robert Gleckner. Blake and Spenser, reviewed by George Anthony Rosso, Jr.
G. E. BENTLEY, JR., University of Toronto, is publishing Blake Records Supplement (Oxford, perhaps 1987), as well as works on Richard and James Edwards, Thomas Macklin, and George Cumberland. MORRIS EAVES, now at the University of Rochester, occasionally taught detective fiction at the University of New Mexico. He recently co-edited Romanticism and Contemporary Criticism (Cornell 1986) with Michael Fischer. ROBERT N. ESSICK, Professor of English, University of California, Riverside, is both a frequent writer on and an avid collector of Blake’s work. ROBERT F. GLECKNER, Professor of English and Director of Graduate Studies in English at Duke University, is currently working on a monograph study of The Marriage of Heaven and Hell. JEAN H. HAGSTRUM has just completed a two-year stay at the National Humanities Center as a Senior Mellon Fellow and will spend September and part of October at the Rockefeller Center in Bellagio, Italy. GEORGE MILLS HARPER is R. O. Lawton Distinguished Professor of English at Florida State University. His latest book is a two-volume study of The Making of Yeats’s A Vision. NELSON HILTON, Review Editor for Blake, is pleased to be in such company. MARY V. JACKSON is Associate Professor of English at the City College of New York—CUNY. She is currently working on a study of memory, imagination, and language in Blake’s early poetry. EDWARD LARRISSY, Lecturer in English at the University of Warwick, is writing a book on contemporary British and American poetry. LOUISE LIPPINCOTT, Associate Curator of Paintings at the J. Paul Getty Museum, is the author of Selling Art in Georgian London: The Rise of Arthur Pond (Yale, 1983). CATHERINE McCLENAHAN, Assistant Professor of English at Marquette University, has published several articles and reviews on speculative fiction and is now completing a book on Jerusalem. ANNE K. MELLOR, Professor of English and Acting Director of Women’s Studies at the University of California, Los Angeles, has recently completed a study of the fiction of Mary Shelley. PETER OTTO teaches English at the University of Adelaide. He recently completed a doctoral dissertation concerned with the relationship between Los, time, and eternity in Blake’s later poetry. GEORGE ANTHONY ROSSO, JR., Assistant Professor of English at Southern Connecticut State University at New Haven, has recently completed a dissertation entitled Blake’s Prophetic Workshop: Narrative, History, and Apocalypse in The Four Zoas. CHARU SHEEL SINGH, Reader in English, Kashi Vidyapith University, Varanasi, India, has published two volumes of poetry as well as The Chariot of Fire (1981). He will be a post-doctoral fellow at Yale University during 1987-88. BRIAN WILKIE, Professor of English at the University of Arkansas, is co-editor (with James Hurt) of Literature of the Western World, and editor of The Aeneid of Virgil, translated by Rolfe Humphries. DAVID WORRALL, Senior Lecturer in English at St. Mary’s College, Strawberry Hill, England, is currently assisting David V. Erdman on an edition of Byron’s Childe Harold for Garland’s Manuscripts of the Younger Romantics.